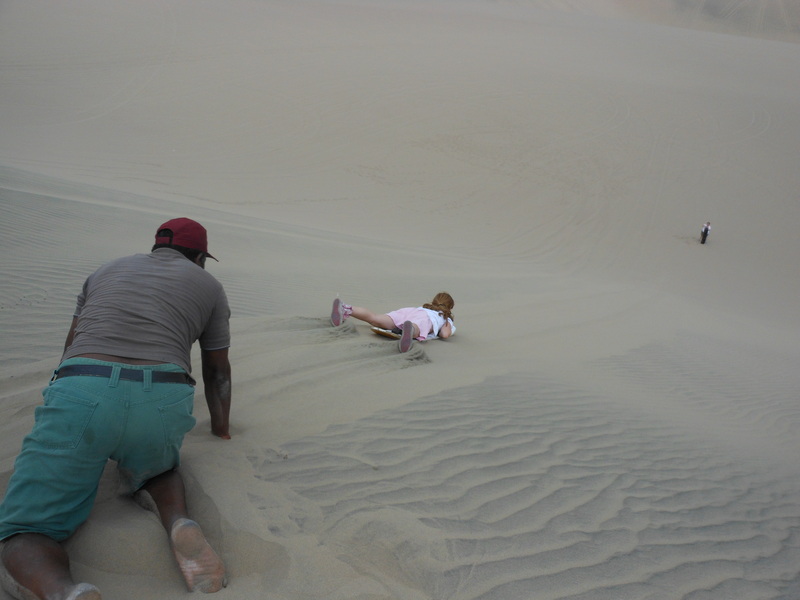 Posted on February 17, 2012, in Difference, Peru and tagged Laguna Huacachina, Peru, photography, postaday, sand dunes, sandboarding, travel. Bookmark the permalink. 26 Comments. And if we had down pillows to stop our slide it would have been “Down the Sand Downs Onto Down”. Uh, we should stop before this gets out of hand. Sign us up. We had such a good time doing this, I can see attempting it again at another site south of the Equator. What a memorable time! It sounds like a blast! It was fun and the sunset over the dunes at the end was a great topper to the evening. Thank you muchly for the kind compliment and thanks for stopping by. It most indeed was fun and the fact that the whole family was able to participate made it that much more special. Wow! That looks amazing but I’d be worried about ‘eating’ it on the way down! As I can tell you from experience, when we went down on our stomach (as pictured), no one “ate” it. There was only time when I went down standing up (as a real boarder should go) that I fell down, but it wasn’t nearly as bad as you might imagine…although I was picking sand out of my pockets for a day or two afterwards. …and a workout-and-a-half climbing back up the hill…which I only tried once. After that breath-taking experience (literally…I was gasping for air), I waited for the dune buggy to come down and pick us up every other time. Wonderful for the this week’s theme! Thanks for the wonderful comment. I appreciate you stopping by. whee! love how you can see the woman at the end of the slide! I do too (and I love her also as she is my lovely wife) and I think it does a good job in showing how far we had to slide on that run. That was our first run and each one became progressively longer. Thanks. Glad you clicked the link and stopped on by.